When you’re making an incredibly unhealthy sandwich, you have two options. One, you can skip the bread and make yourself a snack with two slices of meat with toppings between them. Or, you can go the other route and take bread and wrap it around more bread. No matter what you do, throw in as much cheese as humanly possible. If you thought the Friendly’s Grilled Cheese Burger Melt was a lot of cheese, meet Denny’s Fried Cheese Melt: fried mozzarella sticks smothered in American Cheese and grilled between two slices of sourdough bread. It also comes with a side of fries and a dipping tub of marinara sauce. I suppose that’s the vegetable portion of the meal. Unhealthy? It has to be; the only way it could be worse is if you deep fried it all. A value? 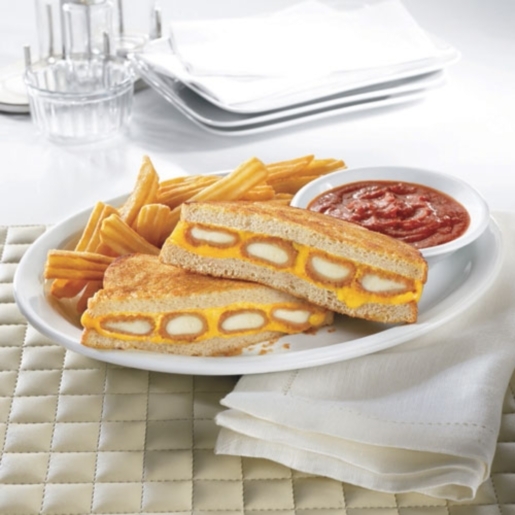 You know it; the Fried Cheese Melt is only $4 on Denny’s new $2 $4 $6 $8 Value Menu! If you love cheese, you know where to go. As for me, I’ll go sob in the corner in a silently traumatized way.